Two most popular favour-related searches on BRIDE.ca: DIY favours and Green favour ideas. 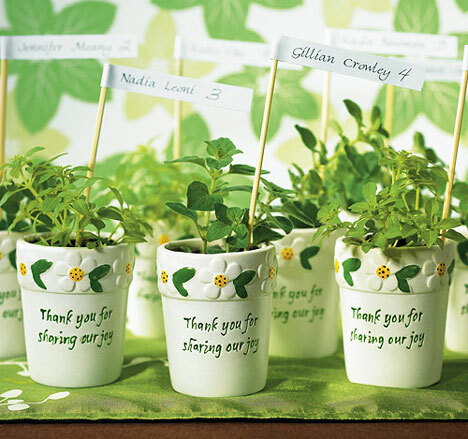 So we went looking for an easy Green+DIY favour idea for your summer wedding. Found it! Potted herbs are not only easy to come by in the summer months but they are also affordable and smell great! Basil, mint, thyme and rosemary are all great herbs that thrive in the summer months and would make a great take home item for your guests. Use painted ceramic pots with pretty ribbons to dress them for the occasion and voila! instant favours.. Place one at each place setting or batch them all together in the centre of the table to create an aromatic centerpiece.